When I first came across this top while browsing the J. Crew website my mind immediately went back to San Jose del Cabo. In 2009 JD and I went down with his family over the summer. In my memories, it was a wonderful trip spent laughing and exploring and soaking up as much sun and salt air as possible. I very clearly remember the day we drove up to Todos Santos to walk around and have lunch in this adorable little place that his uncles loved. JD bought a hammock and Nick and I got parasites. The rest of the trip was awkward. This is what I would have liked to have been wearing. I love maxi dresses and skirts in the summer, as well as for traveling. They're so easy and simple but also elegant and transitional. For a day of exploring I would pair this lovely Tibi number with a cute embroidered top, classic ballet flats, and a dainty bracelet. 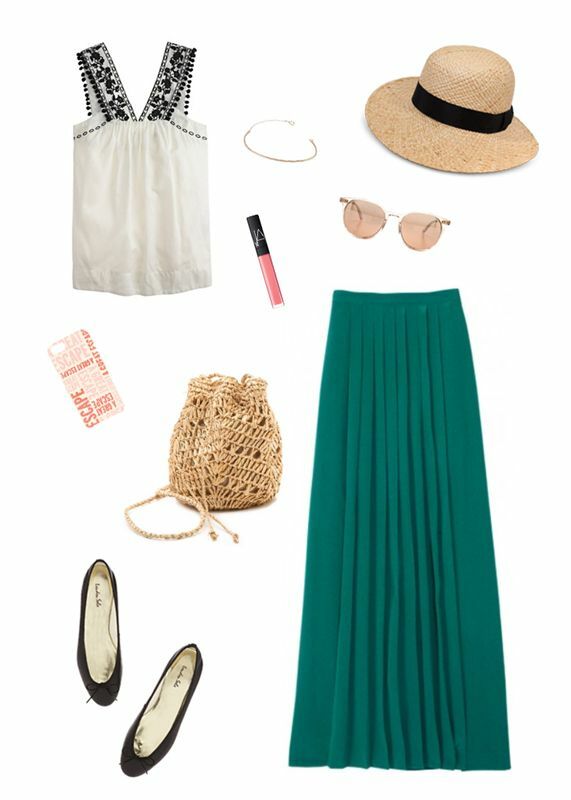 This is the perfect look for a south of the border vacation! The top has been on my wish list for a while now and I love the idea of pairing it with a maxi! This look is perfection!! I am in love with that maxi skirt!! the top and skirt are so beautiful! I'm traveling to the beach and those prove to be perfect essentials for my trip! Oohhhhh this top is amazing! oh my gosh i don't know if i was supposed to but i laughed at that story! this outfit is so great, maxis are definitely transitional and great for day to night! Hi! Just found out your blog by chance. :) Your blog was really great. I love everything in here! Wanna follow each other? Love the J.Crew top, and how it sparks memories for you! That pom-pom top is so charming! The perfect shape and I love the fresh and clean black and white combo! Serious hearts in eyes over this! I want it all!